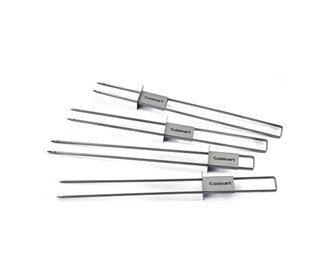 The Cuisinart CSKS-048 is a sliding skewers which loads the skewers with meats, shrimp, or veggies, grill them up, and then release the tasty bites directly onto a plate in one smooth motion. The sliding skewers boast a unique sliding mechanism that easily slides all the food off together without any fumbling over oddly shaped or textured foods. And as an added bonus, the dual prong system keeps skewers steady on a grill, so the food is held in place and evenly heated for perfect barbecue kabobs. 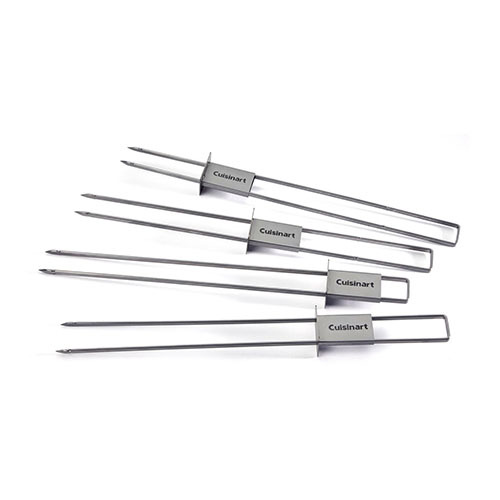 The 11 Inch Sliding Grilling Skewers (4-pack) has many exciting features for users of all types. You can extend the lifetime of your 11 Inch Sliding Grilling Skewers (4-pack) with the purchase of a FactoryOutletStore Factory Protection Plan. See the 11 Inch Sliding Grilling Skewers (4-pack) gallery images above for more product views. The 11 Inch Sliding Grilling Skewers (4-pack) is sold as a Brand New Unopened Item.